Thanks to The Hermeneutic of Continuity for drawing attention to this. A great and timeless Christmas hymn of rejoicing has been murdered by Erasure and a Yamaha keyboard. They should be arrested for crimes against music, but...the video is great! It is ironic that the quite beautiful video should appear in the year of the 500th anniversary of the Martin Luther's apostasy, which ushered in the Reformation, with the battered, ruinous Abbey the centre of the video's focus. 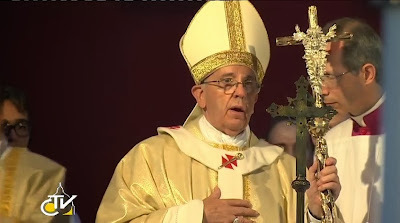 The video has also been produced during the reign of His Holiness Pope Francis, who took his name from the young man of Assisi who heard the words from the Lord, 'Francis, rebuild my Church which as you see has fallen into ruins' from the Cross of San Damiano. Cantate Domino canticum novum. But for Heaven's sake, lose the keyboards and the 1980s drum beat! 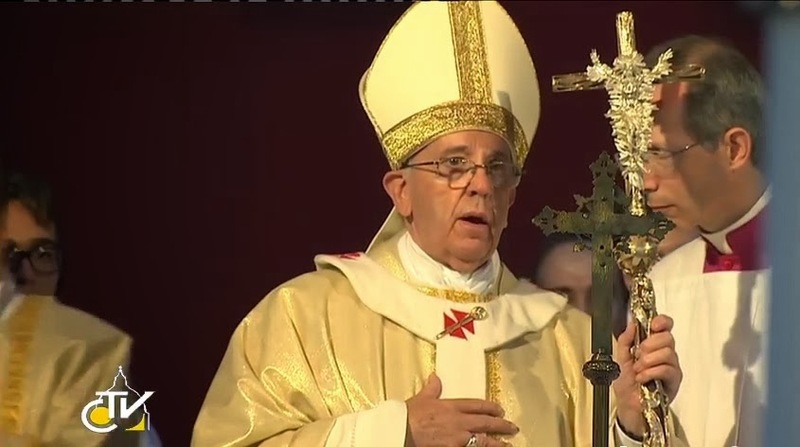 Also, Holy Father...please lose the Ferrero Rocher ferula. It just isn't Catholic! I don't care how many Ferrero Rocher's it took to make it. It's awful! Steeleye Span did a version of this with the same tune back in the 70s. Can't someone arrange for the thing to be nicked? Was the bling ecologically produced? Were the miners paid a just wage? What is the company's health and safety practice? I thought the video rather sinister. But the rendition of the song is very good. It would have been sung with the addition of percussive instruments such as small drums, this is in keeping with the style and age of the piece. On YouTube you will find many versions with drums including one by Tenebrae, an excellent choir. So the Erasure version is actually in keeping with the piece. I agree with Rachel; I actually liked the rendition of the song very much, however the video was EXCEEDINGLY sinister...the light goes out and the monks are left in stunned surprise, while the cold wind returns. yeeesh. ooops....just realized in watching it again that after the cancle goes out (Crucifixion), the star dawns (Resurrection). Maybe not so bad after all.